Exposed hinges are the kind of cabinet hinge you see (or partially see) when the cabinet door is closed. This type of hinges are not concealed or hidden. One wing is attached to the door and the other is attached to the cabinet's face frame (for framed cabinets) or the cabinet wall (for frameless cabinets). These hinges are practiced on doors that allow it to open and close. 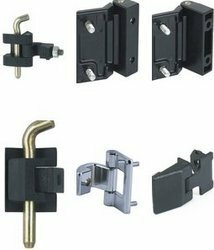 These decorative and functional hinges are designed to fit any home improvement needs and can be availed in variety of colors and sizes. We have positioned ourselves as an illustrious supplier of Electrical Products and Door Fittings. Our wide gamut includes Adjustable Handles, Flexible Conduit & Accessories, Switches, Connectors and Industrial Plug & Sockets. Besides, we also offer Wiring Ducts, Cable Gland & Accessories, Locks, Handle, Knobs, Hinges and Cable Tie. Our products are developed and designed using premium grade raw material, which is procured from trustworthy vendors of the market. The products offered by us are extensively used in shipping, transport and windmill industries. Moreover, these are also used in refineries, petrochemicals, machine building and processing industries. Our firm also caters to the ATEX range for hazardous areas including industries like mining & petrochemical plants. We have a state-of-the-art infrastructure facility, which aids us in the dexterous functioning of all the business operations. Our team of competent professionals assist us proficiently in all the stages of production. Further, we check the quality of our products on varied industry parameters so as to ensure their flawlessness. Owing to our quality-tested products, we have mustered a huge clientele across the country that includes Panduit, Moeller and Mennekes.